"You're not a failure if you don't make it. You're a success because you tried." I was incredibly excited to start NaNoWriMo nearly two months ago. Writing is my first love. So, anything that challenges me to put pen to paper and hone my talent is something that I want to take part in. However, things didn't exactly go as I'd planned (or rather, failed to plan). I failed NaNoWriMo so hard. On November 31st, I came in at just under 10,000 words (but, if we're being honest, I had already given up hope of finishing long before then). I am no writing expert. I just want to share my first NaNo experience with all of you in the hopes that you might learn from my mistakes. I definitely have, and I hope to do better next year! I abandoned working on a project that has been brewing in my mind for years, a project that I have written down a plethora of ideas for, and instead took on a project that popped into my head about a week before NaNo started. That was my first mistake. I didn't have nearly enough time to do all the researching and planning that I wanted to do. For the first 10,000 or so words, my story was going fine. And, then I hit a block and kept wondering "What happens next?". Ultimately, I couldn't answer that question. I spent more time trying to find the answer to that question than trying to meet my daily word goal. And, eventually I fell far behind. So, my first bit of advice is to know what you are going to write about before you start writing. Outline. Know how you want your story to end. I suggest that you know who your characters are, have a good grasp of your world, and do some research before NaNo to prepare yourself. Having a solid plan doesn't work for everyone. Some people are able to just sit in front of a keyboard and let words flow and make magic happen. Those people are called pantsers. I am not a pantser. I am a plotter through and through. Hell, I even planned this blog post. I didn't sit down and start writing down what came to mind. Stream of consciousness is not my style. As I've already said, I should have plotted my NaNo story a lot better than I did. I thought that I would be able to pants it, or at least plot as I went, but that didn't work out. If you're a pantser, that's awesome! And, if you're a plotter, that's awesome, too! Just know what works best for you before you go into a project as intense as NaNo, and stick to that method. Don't try to change your ways right before you start. In one of my favorite songs by Hozier, "Arsonist's Lullaby", he sings: "Don't you ever tame your demons". As beautiful as that song is, it does not apply to NaNoWriMo. I have two behemoth demons with gnashing teeth that are always warring inside of me: perfectionism and procrastination. These are both big problems when it comes to writing. During NaNo, you don't have time to be perfect. You can't continuously go back and edit or change things -- you'll never finish. And, the same goes for procrastination -- you can't put off writing or you'll never finish. In the end, I would say that procrastination got the best of me. I was able to reign in my perfectionism for the little bit that I did write. But, procrastination is harder to tame. I swear that putting things off has been embedded into my blood, coded into my DNA (I blame my mother). Going into NaNo, it's good to be aware of your strengths and weaknesses and to think about how they might effect your writing progress. Do you have problems with managing your time wisely? Create a daily schedule. Are you easily distracted? There are plenty of apps that block online distractions. Do you live in a busy house and need a more quiet environment? Head to your local library or coffee shop (the caffeine will probably help, too!) Do you like to listen to music while you write? Create a playlist before you start! Here's a playlist I created for one of my projects. Writing everyday is HARD. Writing every other day? Sure. No problem. But, coming up with creative content every day (1,667 words to be exact) is a challenge. If NaNoWriMo was easy, everyone would do it. Writing takes time. I think I have this big dream in my head that I'll snap my fingers or merely wiggle my nose and BAM! A literary masterpiece! But writing doesn't come that easy. Nothing in life comes that easy. Writing, like many things, takes dedication and motivation and perseverance. NaNoWriMo is no easy undertaking, so take advantage of any support you can find. Local writing groups are a thing for a reason. NaNo Buddies and cheerleaders are available for a reason. Whatever motivates you, do that. 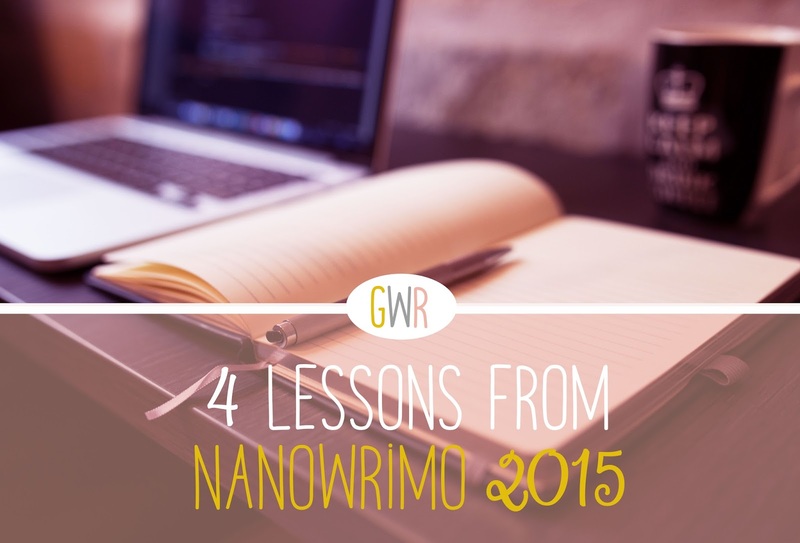 My NaNoWriMo 2015 mistakes are definitely going to help me prepare for next November. But, for now, I am more than happy to rest my mind. There shan't be any more late nights staring at super bright computer screens while the rest of my house and the world snoozes and dreams little dreams. No longer shall I suffer from caffeine overdoses, my heart pounding in my chest at 3am and my body unwilling to fall asleep. No more brain farts and thesaurus searches and texting my best friend to ask: "What's that pretty sounding word that starts with an 'e' that means...? I'm not sure what it means." Now I can watch TV just for funsies rather than pretending to "do research", only to end up feeling hella guilty afterwards because I wasted 3 hours watching Jane the Virgin instead of writing. No more headaches and writer's block and creative burnouts. No more! I'll see you next November! p.p.s. If you're like me and you didn't meet your NaNo goal this year, know that there's still hope for tomorrow. Writers write every day. Keep writing and keep prepping for NaNo and keep striving for that goal of becoming the next great novelist. I know I am! Let's take the journey together. In the words of the late, great Aaliyah, "If at first you don't succeed, you can dust it off and try again." I like the sentiment of "writers should write everyday." Great advice!